MV Joyita was a merchant vessel from which 25 passengers and crew mysteriously disappeared in the South Pacific in 1955. It was found adrift in the ocean without its crew on board. The ship was in very poor condition, including corroded pipes and a radio which, while functional, only had a range of about 2 miles due to faulty wiring. Despite this, the extreme buoyancy of the ship made sinking nearly impossible. Why then was nobody on board? Enter the Mary Celeste of the Pacific. The ship was originally constructed in 1931 as a luxury yacht for the wife or a Los Angeles based film director. “Joyita” translates to “little jewel”. Just prior to the attack at Pearl Harbour in 1941, the US navy acquired the ship for use in patrols. In 1943 the ship ran aground and needed new pipework to fulfill the demand for ships by the navy. Fatefully, the pipes laid were galvanised iron, and not the more tried and tested copper or brass. By 1948, the boat had changed hands again and was now carrying freight for the Louis Brothers firm. About 5:00 AM on October 3, 1955, the Joyita left Samoa’s Apia harbor bound for the Tokelau Islands, about 270 miles (430 km) away. The boat had been scheduled to leave on the noon tide the previous day but her departure was delayed because her port engine had issues. The Joyita eventually left Samoa on one engine. She was carrying 16 crew members and nine passengers, including a government official, a doctor and two children. The Joyita was scheduled to arrive in the Tokelau Islands on October 5. On October 6 a message from port reported that the ship was overdue. No distress signal had been picked up on land or by other ships at sea. Eventually a search and rescue mission was launched starting on October 6th. By October 12th, the Royal New Zealand air force had covered an area of nearly 100,000 square miles, but still no sign of the ship or its crew was found. Five weeks later, on November 10, Gerald Douglas, captain of the merchant ship Tuvalu sighted the Joyita more than 600 miles (1,000 km) west from her scheduled route, drifting north. 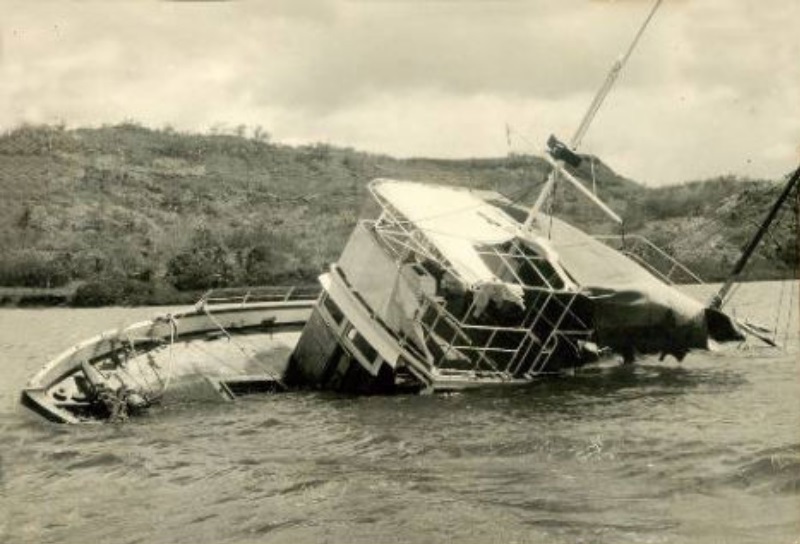 The ship was partially submerged and listing heavily (her port deck rail was awash) and there was no trace of any of the passengers or crew; four tons of cargo were also missing. The recovery party noted that the radio was discovered tuned to the international marine distress channel. A subsequent investigation of the ship turned up more questions than it did answers, and almost all of them were chilling. Some of the boat had been damaged, though by what it is not known. Many of the windows were broken, the flying bridge was smashed and the deck lights were not fully functional. A canvas awning had been erected on top of the deck house, though no signs of it being used as a shelter were found. There were not enough life jackets for everybody on board, but the dinghy and life rafts the boat did carry were all missing. Eerily, the starboard engine was found completely covered by mattresses, while the remains of the still broken port engine lay still disassembled. A pump was mounted on a plank between the two engines, though nobody had ever connected it, and so investigators don’t know why it was there. The radio on board was tuned to the international distress channel, but when the equipment was inspected, a break was found in the cable between the set and the aerial. The cable had been painted over, obscuring the break. This would have severely limited the range of the radio to about 2 miles (3.2 km). Whether the captain knew about this or not is unknown, and it is unclear whether the radio had been tampered with. All the clocks on board were stopped at 10.25pm. Investigators found that downstairs switches for the cabin lights were on, implying that whatever had occurred happened at night. The ships’ logbook and other navigational equipment, as well as the firearms Miller kept in the boat, were missing. The doctor’s bag was found on the deck, with most of the equipment missing. Four lengths of blood-stained bandages were found inside. Looking at the amount of fuel left in the tanks, it looked as though the boat had made it within fifty miles of port before disaster had struck. When the investigators studied the vessel, they found out exactly what that disaster was. When she was moored back in harbour at Suva, they heard the sound of water entering the vessel. It was found that a pipe in the raw-water circuit of the engine’s had failed, allowing water into the bilges. The first the crew would have known about the leak was when the water rose above the engine room floorboards, by which time it would have been nearly impossible to locate the leak. Also, the bilge pumps were not fitted with strainers, and had become clogged with debris, meaning that even when the crew knew about the leak it was too late to pump out the water. Even so, investigators were puzzled. Fitted out for carrying refrigerated cargo, the Joyita had 640 cubic feet cork lining her holds, making her virtually unsinkable. In addition, further buoyancy was provided by a cargo of empty fuel drums. Why had the captain and crew left? It would have been far safer to wait for rescue aboard the sturdy wreck than to risk their lives out in the open water. To the investigators, things didn’t add up. One of the first theories put forward was that of the injured captain. Captain Miller was well aware of the vessel’s ability to stay afloat, leading some to speculate that Miller had died or become incapacitated for some reason. Without him to reassure the other people on board, they had panicked when the Joyita began to flood and had taken to the liferafts. However, this in itself would not account for the missing cargo and equipment, unless the vessel had been found abandoned and had her cargo removed. A friend of Miller’s, Captain S. B. Brown, was convinced that Miller would never have left the Joyita alive, given his knowledge of her construction. He was aware of tension between Miller and his American first mate, Chuck Simpson. Brown felt that Miller and Simpson’s dislike of each other came to blows and both men fell overboard or were severely injured in a struggle. This left the vessel without an experienced seaman and would explain why those remaining on board would panic when the ship began to flood. A second theory put forward was far more infamous. Many newspapers at the time clamied that the Joyita had passed through a fleet of Japanese fishing boats during its trip and “had observed something the Japanese did not want them to see.”One paper theorized that some active Japanese forces from World War II were to blame for the disappearances, operating from an isolated island base. There was still strong anti-Japanese feeling in parts of the Pacific, and in Fiji there was specific resentment of Japan being allowed to operate fishing fleets in local waters. Such theories suddenly gained credence when men clearing the Joyita found knives stamped ‘Made in Japan’. However, tests on the knives proved negative and it turned out the knives were old and broken- quite possibly left on board from when the Joyita was used for fishing in the late 1940s. Others theorize that modern pirates attacked the vessel, killed the 25 passengers and crew (and cast their bodies into the ocean), and stole the missing four tons of cargo. The final theory claimed the head strong captain had tried to reach his destination despite the heavy damage, and the crew had simply mutinied to ensure their own safety. Taking the life rafts and the injured captain with them, they succumbed to heavy winds and were lost. No signs of the crew or passengers of the MV Joyita were ever found.